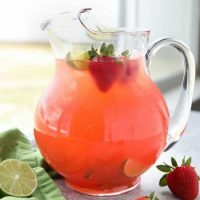 Strawberry Agua Fresca (agua fresca de fresa) is an easy Mexican drink of refreshing fruit water that is lightly sweetened and uses fresh summer strawberries. Agua fresca, Spanish for “fresh water” or “cool water” is made with water and fruit. 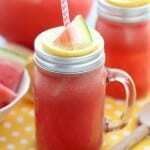 It’s a much lighter and more refreshing drink, composed mostly of water with fruit blended or squeezed in. Agua fresca is different than juice, which consists of mostly fruit and little water. Since the majority of agua fresca is fresh water, it is a very hydrating and refreshing summer beverage. 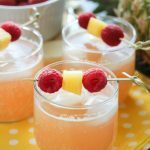 WHAT SWEETENER SHOULD I USE IN AGUA FRESCA? If you want a really smooth (and inexpensive) agua fresca drink, I suggest using a simple syrup (sugar water). Simple syrup is made with equal parts granulated sugar and water, heated until the sugar crystals dissolve. It’s a common ingredient used for cocktails/mocktails. If you choose to use a granulated sweetener like white or brown sugar, keep in mind that it may take a lot of time, and stirring, to dissolve into cold water. You can choose to add granulated sugar to some sliced strawberries and allow time for maceration — where the sugar semi-dissolves and pulls liquid from the fruit, creating a syrup. I suggest allowing 30 minutes or more at room temperature for this method. Honey and agave nectar are also great natural sweeteners. Please note, artificial honey will dissolve easily into water, whereas pure honey may take longer to stir and dissolve in cold water. Heating it up first may help, but don’t be surprised if some honey still settles at the bottom. Agave nectar can be stirred into cold or warm drinks and it homogenizes easily. This would be my second choice if you are going for a smooth, non-grainy drink. Keep in mind, agave is approximately 90 percent fructose, and is perceived to have a sweeter flavor than granulated sugar. Because it tastes sweeter, you do not need to add as much agave to the agua fresca to obtain the same level of sweetness. 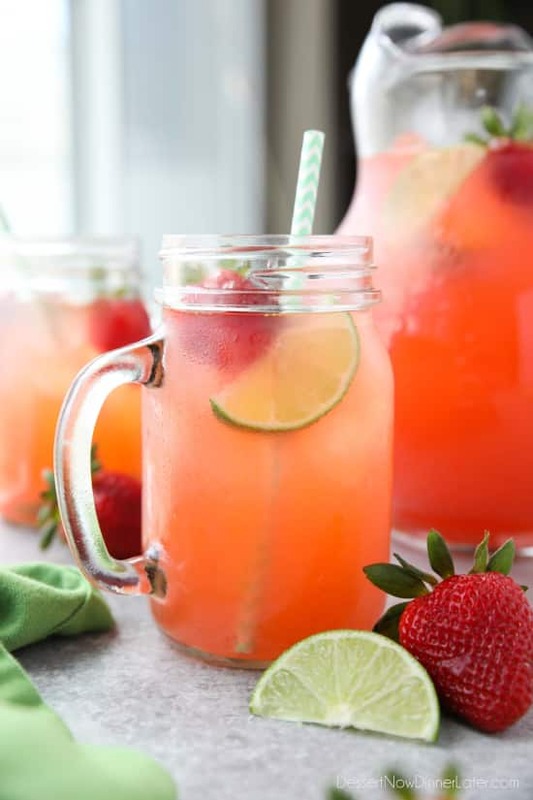 This Strawberry Agua Fresca is a wonderfully refreshing, lightly sweet, drink. 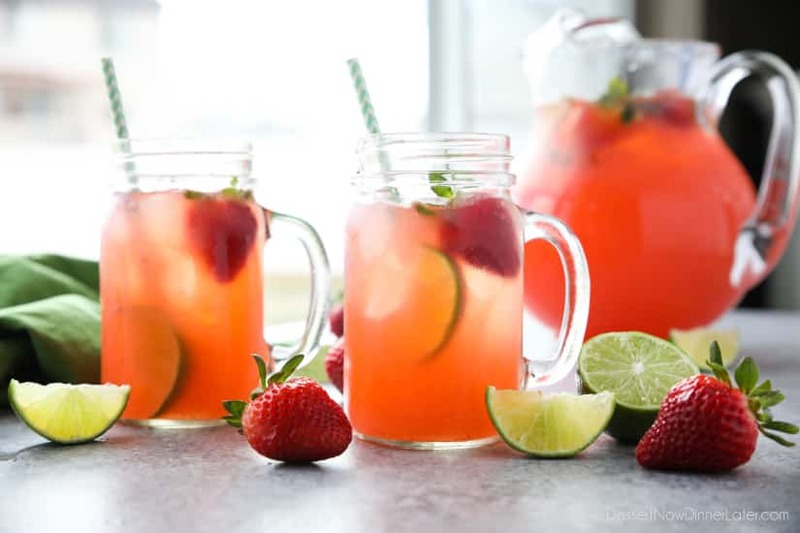 Fresh, sweet strawberries are blended with cold water, sweetened with simple syrup, and brightened with freshly squeezed lime juice. The color is pretty and the flavor is simple and natural. Yes! Agua fresca can be made with almost any fruit. Some fruits, such as melon and apples, can be blended into the water after you remove the skins, seeds, and stems. Simply cut them into chunks and blend them with the water. Berries can be used whole, but sometimes the seeds are off-putting, so agua fresca with berries may need to be strained before serving. I recommend using cheesecloth inside of a fine mesh strainer to catch smaller seeds, like from the strawberries in this drink. Fibrous fruits like pineapple in agua fresca will also have a better texture after being strained. Citrus fruits can be juiced and added straight into the water. 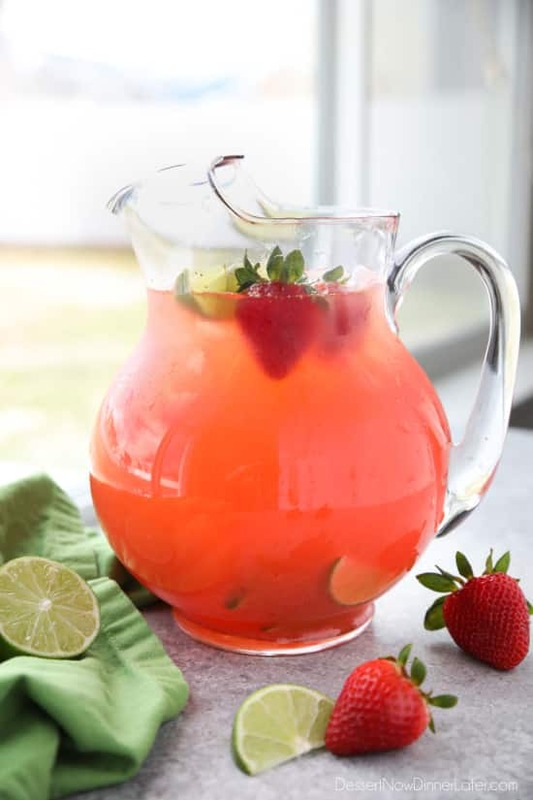 What could make this strawberry agua fresca even better? Make it with de leche (milk)! 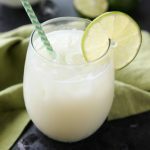 If you like creamy drinks, use some sweetened condensed milk for part of the sweetener — like in this recipe from Growing Up Blackxican. 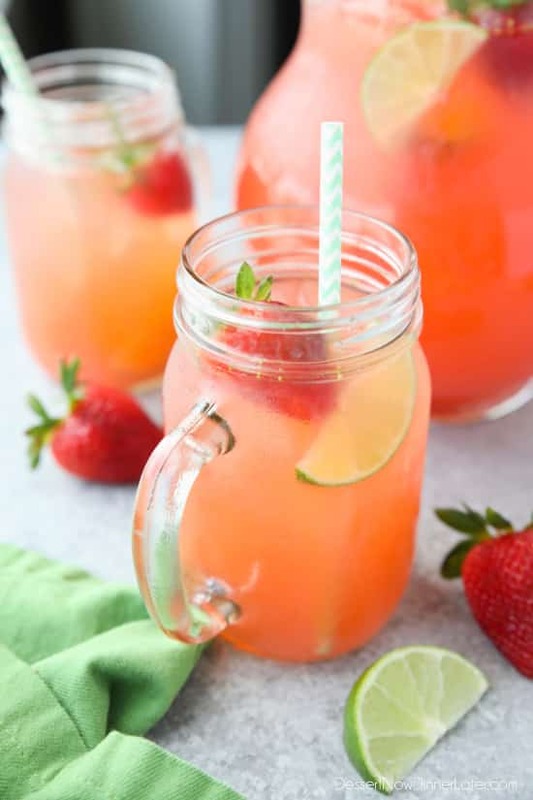 Sweetened condensed milk is really good in my Brazilian Lemonade, so I’m betting it’s just as good in this strawberry agua fresca! Blend strawberries with 1/2 cup of simple syrup and 1 cup of cold water until smooth. Set a fine mesh strainer (with a layer of cheesecloth, if you have it) over a large pitcher. Pour the strawberry mixture through the strainer. 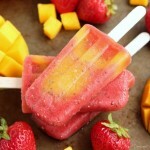 Use a spatula to press the fruit/pulp through. Repeat if needed. Discard the seeds/pulp. Add the remaining 7 cups of water and lime juice to the pitcher. Stir and add extra simple syrup to desired sweetness, if needed. Keep cold, or serve with ice. *Refer to blog post for options of alternative sweeteners and how to use them.